The Nyangatom live south of Omo National park and occasionally migrate in to the lower regions of the park when water or grazing is scarce. 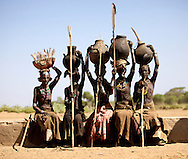 Numbering around 6,000-7,000 in population, the Nyangatom are agro pastoralists, relying on cattle herding and floor- retreat agriculture (consisting mainly of sorghum harvesting on the Omo and kibish Rivers). The Nyangatom tend to indulge in honey and frequently smoke out beehives in the park to get the honey inside the nests. The Nyangatom are known to be great warriors and quite frequently, active warmongers, they are often at war with the neighboring tribes including the Hamer, the Karo and the Surma. Small group of Nyangatom along the Omo are specialised crocodile hunters using harpoons from a dugout canoe. The elders of both sexes wear a lower lip plug, the men’s being made from ivory and women’s made from copper filigree.